With contributions from Lara W.
Psoriasis is a complicated and unpredictable disorder, as every patient knows very well. It’s an autoimmune condition, which means the problem starts deep under your skin, but what goes on in and around your body could certainly impact the severity of your symptoms, too. You likely find that cold weather, dry air, and airborne irritants tend to inflame your skin, but how about what you eat? Your daily diet may not be able to completely break the cycle of itchy, patchy, scaly eruptions, but adding some healthy ingredients could relieve a good deal of discomfort and improve your quality of life. The medical community has turned their attention to diet and psoriasis for several years, but as of now, they haven’t found any link between psoriasis flares and any specific foods. What they do know is that the more extra weight you carry, the worse your symptoms will probably be. The strongest evidence to support a link between diet and psoriasis centers on body mass index (BMI). Researchers have found that the higher your BMI (which translates to a higher number on the scale), the higher your chances of developing psoriasis and psoriatic arthritis, and the worse your psoriasis symptoms will become. Gene mutations: You may be more predisposed to psoriasis than you imagine, and if your genes make you more likely to develop the disorder, a higher weight could be the tipping point that sends your skin into a flare. Cytokines: Fat cells secrete proteins known as cytokines, and they spark inflammation in the body. Since psoriasis is an inflammatory disease, it follows that your symptoms will be milder if you have fewer cytokines. Studies have found that patients who can get rid of extra pounds will see a quick improvement in their symptoms, but will also significantly lower their risk of related inflammatory disorders that can complicate health down the road. When you live with psoriasis, your risk of heart disease, diabetes, and stroke are higher than average. Losing weight is the best way to get your blood pressure and cardiovascular health back to healthy levels. Gluten-free diets are certainly in vogue, and many people are getting on board for a variety of health-related reasons. But when it comes to gluten and psoriasis, the answer isn’t so simple: it can be a good idea for some, but going gluten-free might not help you at all. Having psoriasis doubles your chances of developing celiac disease, which is a severe intolerance to the gluten protein found in wheat, rye, and several other grains. One study followed a group of people with psoriasis who also had celiac disease, and found that once gluten was eliminated from the diet, almost 75 percent of patients enjoyed a reduction in their psoriasis symptoms. On the other hand, psoriasis patients who did not also have celiac disease showed no improvement in their symptoms once they went gluten-free. Since a gluten-free diet can rest on expensive substitutes, it’s not a prudent choice if you haven’t been diagnosed with celiac disease. However, the focus on natural, unrefined plants and lean proteins is one aspect of the gluten-free lifestyle that will certainly benefit anyone. Next Page: What foods to eat with psoriasis. There are no exceptional ingredients for psoriasis relief, but there are groups of components to include in your skin-friendly menu that can bring results. It’s important to get a wide range of vitamins and minerals to keep every system in your body functioning well, but vitamin A and vitamin D are extra important for skin health. Foods rich in vitamin A (think carrots, mango, and sweet potato) are also great for your eyes and will help to protect your cells. As for vitamin D, it may be better to get your daily dose in the form of sunshine rather than supplements. Too much vitamin D can bring side effects by raising the calcium level in your blood, possibly leading to kidney stones or gout. Ten to fifteen minutes of sunlight should give your body the dose it needs. Antioxidants protect your cells against damaging free radicals, and that adds up to a reduced risk of cancer, heart disease, and other chronic, systemic diseases. They may not magically erase your psoriasis symptoms, but antioxidants will give your body the strength it needs to function well, and hopefully overcome the inflammation. These protective compounds are found in all sorts of fresh fruit and veggies, but in general, aim for the brightly colored varieties for the biggest helping of antioxidants. Blueberries, currants, squash, leafy greens, tomatoes, carrots, black beans — the list is long, and the more variety you include, the wider the spectrum of nutrients you’ll take in. Out of all the nutritional supplements out there, experts have the most confidence in omega-3 fatty acids when it comes to psoriasis relief. These compounds target inflammation in the body while they improve cell function. The anti-inflammatory power of omega-3s is remarkable, so there’s good reason to swap out omega-6 fatty acid sources (like soybean oil, sunflower oil, and canola oil) for omega-3 fats (coconut oil, olive oil, and fatty cold water fish) in your daily menu. Add in a fish oil supplement for an even bigger omega-3 boost. Nuts are similar to fish in terms of providing excellent types of fats. These aren’t the bad sorts of fat that we’re taught to stay clear of. You wouldn’t want to eat heaps of them, but in moderation, they can provide good fats to help with inflammation. Brazil nuts especially seem to be good for people living with psoriasis, so adding a few of those to your diet may go a long way. You can’t go wrong with eating plenty of fresh fruits and vegetables. They contain an abundance of minerals and vitamins. They’re easy for your body to process and don’t have the same inflammatory properties of many other types of foods. Also, fruits and vegetables are known to be great for your gut, which, as mentioned when discussing dairy, there may be a connection with people living with psoriasis. 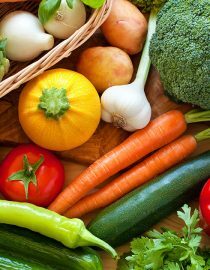 If you increase the intake of fruits and especially vegetables into your diet, you may well notice an improvement in your psoriasis and your overall wellbeing. Next page: what foods to avoid eating with psoriasis.